Scarlet Tanager or Yellow Bellied Fly Catcher? I've seen this bird around lately. Yesterday it was a little shaken up after it flew into the window but eventually flew away. 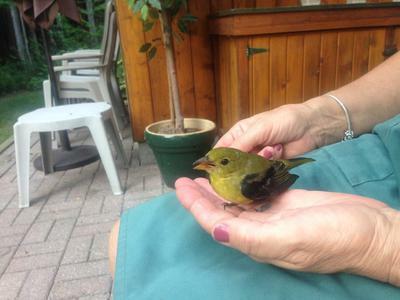 I hope one of our readers can help identify this bird. To me, it looks more like a Fly Catcher than a Tanager, but I'm sure someone on here will know for sure. Comments for Scarlet Tanager or Yellow Bellied Fly Catcher? It appears to be either a female or juvenile Scarlet Tanager. Lucky you to see it, hopefully it makes a full recovery.